A Facebook group is like a garden, to borrow an analogy from Chance, the Peter Sellers character in Being There. It will not grow properly without cultivation. Because a group is so easy to create, billions have been formed. Facebook currently has 400 million active users, and the average user is a member of 13 groups. Do the math. 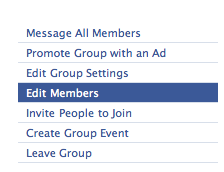 The vast majority of Facebook groups have precious little activity. As a group administrator, you have tools at your disposal that the other members don’t have, and which are crucial to keeping the group vital and active. 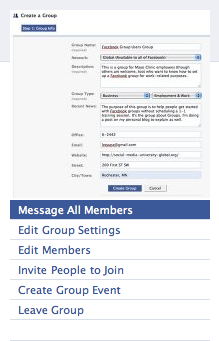 This enables you to send a message to the Facebook Inbox of all group members. A good time to do this is when there is a Discussion Board topic or Wall post for which you would like their feedback…or a new video that has been uploaded, or a new event created. This is a way to keep your group top of mind among members. 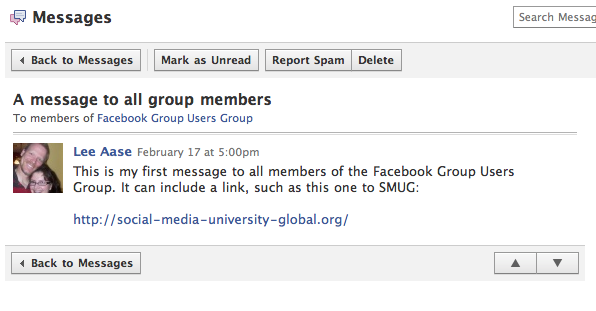 Don’t abuse it by sending too many messages; otherwise your group members will leave. But if what you are sending is meaningful and worthwhile to them, they will welcome it. Your goal should be for the group to be useful to its members. If you are sending a message just to keep the group going, and not to help your members, that’s a sign you’re doing it for the wrong reasons. And your members will sense it. Remember, the group doesn’t exist for itself; it exists for its members. 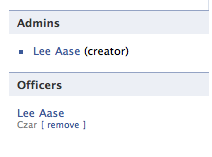 You also may want to Edit Members of your group to designate some of them as Officers or Admins. Be careful with your designation of an Admin; these individuals will have the same rights with the group as you, the creator, do. But you may wish to have at least one additional trustworthy person as an Admin. Officers, on the other hand, can be multiplied. By designating officers with any range of titles you can enable group members to find the person who may best be able to answer questions. In an academic program interest group, for instance, you may have someone other than the group creator designated as Program Director or Admissions Counselor. Or if you were to use Facebook as an online newsroom, you could indicate what specialty beats a particular staffer covers. 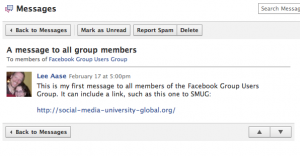 In this way, a member can send a private inbox message in Facebook to a designated officer, such as a journalist identifying the staffer who covers the cardiology beat. Then when you look on the front page of the group, your officers will be listed, so interested members or visitors can know which person they should contact. I don’t know what I was thinking when I did this originally; I can’t believe I chose “Czar” as my office instead of “Chancellor.” I’ve since fixed that. What’s your experience? How else do you create community in a Facebook group? I am so glad that there are other ladies there for us. Without the support We would be lost. I want to thank all of the ladies out there for this and pinkcycle. I will always do what I can to contribute.